I remember the weather changed before Sunday night Study Hall (1900 - 2100) (7:00 P.M. - 9:00 P.M.) was over. The temperature was dropping fast and the ice storm had started. I think the thermometer stopped at -2 degrees F*. Then Tattoo sounded at 2100 for Study Hall to be over. That meant we had thirty minutes until Taps(2130). All of a sudden there was a loud noise out on the fire escape just outside our window. A frozen uniform was being banged against the window! Phillip Potts('63) who was then acting Battalion Commander and lived in the back room on the ground floor of Russell Hall. His room had a door that went out the back of the building. He and a friend went out back and pinned a class B (gray cotton) uniform shirt and pants together, poured hot water over it until it was frozen solid. When you stood it up it looked like it was full of ice! Later they took the uniform down to the sidewalk leading from the Headquarters / CQ room to the front road and wrapped towels around the cuffs of the pants and poured water over them. Finally the entire uniform was standing in front of HQ all by itself! I wish I could have seen the expression on General Futch's face when he parked his car beside this headless iceman the next morning! I think it stayed cold for a week, and the iceman stood out there almost the whole time. 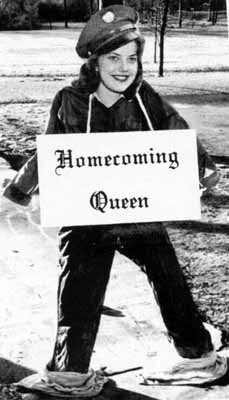 The yearbook staff thought it would be funny to add the girl's head and Homecoming Queen sign to the picture. It was not my idea to make the Iceman an Icewoman. By the way, I did not know that Phil Potts made the iceman until I talked to him today 11/12/97! When General Futch arrived he realized that our new NDCC (National Defense Cadet Corp) campus jackets were not going to be heavy enough to keep us warm so he issued a strange order. The order was given "The Uniform-of-the-Day is any uniform that will keep you warm!" Well, that let the cat out the bag! Some of the older cadets still had Navy Pea coats from years past. Supply loaned out all the old Pea coats they had. Some of the boys got their civilian coats out of Supply. One cadet, Terry Enzor('63) came up with his father's Air Force overcoat! That thing went down past his knees! The campus jackets only went to your waist. We all wished we had an USAF overcoat! To help cut down on the biting cold wind some cadets cut their sweat pants off below the knees, cut eyeholes in the cloth and pulled them over their heads and, voila, instant ski mask! I could not afford new sweats so I could not cut mine up but I did have some long underwear! This was my third year at LWMA and I knew how cold it could get! The year before I got caught in a snowstorm while camping in the back woods. * The record low temperature in Atlanta, GA for January 24 is -3 degrees F set in 1963 as reported on WSB-TV 1/24/98!